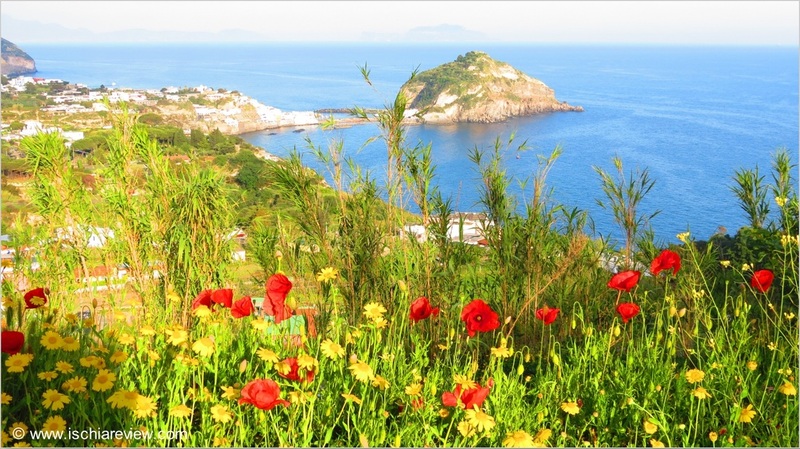 The Sentiero Baia Pelara is a walking trail in Panza on Ischia's west coast. Il Sentiero Baia Pelara is a beautiful walk from the village of Panza down to the scenic bay of Pelara with its rocky beach. The terrain changes from woodland to open valley and ends up at the bay below. At times you will feel like your are passing through the Scottish highlands or an English forest as the greenery is at odds with Ischia's warm climate. From the main village square in Panza, follow the signs towards Sorgeto Hot Springs but don't go all the way down. After about ten minutes of walking from Panza Village you will see two signs on your right hand side, pointing towards "Sentiero Baia Pelara" and "Monte di Panza". These are two separate walks but they start from almost the same place. You'll eventually see the start of the Baia Pelara walk which is signposted and leads down some wooden steps. After passing a vineyard on your right you soon enter a wooded area. These woods are the home to lots of wildflowers and butterflies as well as a hermit's cave that you'll no doubt want to have a peek into. As you leave the woods you enter the top of a valley with a rope fence that leads you down to the bay at the bottom. At first the descent appears to be quite steep but it evens out and any vertigo sufferers such as myself will be absolutely fine. The descent down to the bay is nice and easy and once you're there you can sit and have a rest on one of the benches. At this point the path is marked with "Fine del Sentiero" meaning "End of Path". Some people choose to go beyond this point and climb down to the beach but beware this can be very dangerous, especially if you do not have the correct footwear. Once you're ready to continue you go back in exactly the same direction and without including the time spent at the bottom by the bay, the whole walk takes around an hour from start to finish.